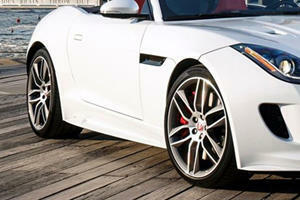 I felt a little intimidated when the Jaguar rep handed me the keys to a brand-new F-Type S for the week. Can you blame me? The week before I was driving the epitome of a dad-mobile, the 2016 Honda Civic Sedan. Now, the key (fob) to a beast that sends 380 horsepower to the rear wheels was in my grasp, and I was being told to have fun and not to break it. Thankfully, the Jag was returned unharmed and I had a hell of a time driving it. But my time with the F-Type S didn’t get off to the best of starts. In fact, I felt incredibly inadequate fumbling around the cabin for the buttons that adjusted the side mirrors and driver’s seat. I eventually found them—they live on the door—but once I departed the curb in front of my building I ran into a new problem. For starters, I couldn’t see anything behind me with the top up. I quickly learned to trust my mirrors, which were given further functionality courtesy of the optional Premium + Vision Pack ($3,900) that added blind spot monitoring. But in that first instance I was terrified of causing an accident due to an inability to see over my left shoulder. My second issue was with the throttle. 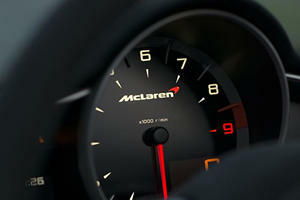 I didn’t know how much stimulation to give a pedal that sends signals to supercharged 3.0-liter V6 engine. But after a few gentle taps it was apparent that while the Jag is fast, it’s not dangerously quick. So I hit the highway and began my week-long odyssey with the F-Type S Convertible, by the end of which I had become a better person. This feeling wasn’t derived from the amount of eyeballs the F-Type S attracted (it got plenty of looks), but by how driving it made me feel. A typical trip in the Jaguar started something like this: Cram my 6’1” frame into the tiny roadster, drop the top, deactivate the auto stop/start function (which is annoyingly active upon startup), engage the active sport exhaust and then speed off. The F-Type S may not pack a V8 but its exhaust note is incredibly intoxicating. In fact, there were very few times when I drove with the exhaust silenced. I relished its sound, especially in tunnels and under the Bay Bridge where its roar reverberated for all to hear. Although the exhaust sounded incredible my thrills were tempered just a bit by the eight-speed automatic transmission. QuickShift and paddle shifters are a fine combination, but I really wanted to row my own gears. 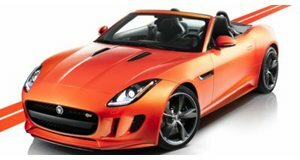 The more powerful F-Type R is only available as an automatic with AWD, which makes the S with a six-speed manual and RWD the purist's choice. But despite wanting a stick I didn’t feel cheated by the automatic whatsoever. The Jag was a joy to drive and quickly leveraged its 339 lb-ft of torque whether I was asking it to blow past a car on the highway or upshifting out of a tough curve, this despite its portly 3,536 pound curb weight. On winding roads I was happy to have a limited-slip differential and Driver Stability Control (DSC), but getting the back out was as easy as deactivating DSC. Stopping power comes from 15-inch discs up front and 12.8-inch discs in back, with brake dust all but guaranteed to gather on the 19-inch wheels. It was during my more enthusiastic drives when the active aero was guaranteed to be up that I engaged “Dynamic Mode.” This mode allows you to tune the gear shift, throttle response, steering and suspension. But when I say “tune” what I really mean is “turn on/off.” There is no endless array of information to ingest or buttons to push. There are other functions, though. These include a lap timer, G-force meter and pedal graph. I didn’t really play with these but I could see the lap timer being fun to test out the F-Type S’ 4.8 second 0-60 mph time and would love to see how much gas pedal mashing it takes to hit its reported top speed of 171 mph. Of course if you chose to unleash the F-Type S’ full performance potential you can expect your fuel economy to tank. The Jag gulps gas when you put your foot down, but with cruise control set at 70 mph and the top up I did average 20 mpg on the highway. This is a far cry from the automaker's claimed 19/27/22 split, however. For some, Dynamic Mode may be annoyingly low-tech given the car’s price and performance (my tester stickered at $91,220). But I actually liked the simplicity and not having to spend forever pressing buttons. That said, I did find myself endlessly pressing buttons when it came time to navigate the touchscreen infotainment system. The 8-inch screen isn’t the F-Type S’ strongest feature, with the navigation system being especially annoying and difficult. I also found it a pain to connect my iPhone to it via Bluetooth. The 12-speaker 770-watt Meridian sound system did sound great, though. But I mostly left the screen alone and enjoyed the sumptuous amounts of leather that covered the performance seat and cabin. Both the seat and extended cabin leather were options at $1,500 and $2,325 respectively. These may not be necessary for everyone but the $600 metallic British Racing Green paint is something I’d totally spring for. It’s difficult to accurately explain how driving the F-Type S made me a better person. The best example I can give is skydiving. It takes hardly any effort to do and lasts a short time, but after you hit the ground you have a deep sense of self-satisfaction from within. You don’t become a kinder or gentler person but you just feel better for having had such an experience. I’ve never been skydiving but I now want to after having spent a week behind the wheel of the F-Type S Convertible. Yes, there is a car we had more fun in than the McLaren. Rory Reid was one of new Top Gear's best and underused assets. Glad he's sticking around for the next series. Wrapping yourself in bubble wrap is a safe way to live but is that really a way to exist?